More Than Just A SAHM: Congratulations Congressman Manny Pacquiao! 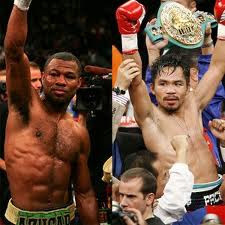 Manny Pacquiao successfully defended his WBO welterweight title against Shane Mosley. Pacquiao chose to wear yellow gloves in this fight. He said that yellow signifies unity of the Filipino across the globe. I hope that all of us will continually support the biggest fight of his life now, poverty. Congratulations Congressman Manny Pacquiao! Yeah!!! congrats to MANNy! He brought honor to our country again!